First, you want to make sure you have some wood for smoking that has been soaking in water for several hours at least; the wetter the wood the better, and it will give you more smoke and the wood will have a slow burn. The Columns Hotel used Mesquite wood most of the time but on occasion we would get in some hickory, pecan, or oak. The Mesquite came in huge chunks, about two to four inches in diameter, and this was great for stoking the fire and letting it sit without much babying. The whole smoker set up was located outside the back kitchen door and away from any combustibles, for good reason. Our next step has us lighting the charcoal and getting the coals hot in the bottom pan of the smoker, thus ensuring a good stoked fire. As the coals were getting hot, we run back inside to set up the seafood. The two round wire racks of the smoker are first covered with aluminum foil and then several holes are punched through the foil with the blunt end of your common sharpening steel. Or, you could use any rounded tool with about a ½-inch diameter to poke holes into the foil lining. The foil and the holes are done to allow the smoke to freely move among the chamber but also and importantly, to keep the food product from falling out and making a really big mess…and to keep chef happy…thus preventing any undue scorn that might befall the apprentice. Then in a small bowl each of the individual seafood ingredients is coated one at a time with a tiny bit of olive oil, just enough to coat and then seasoned with a small amount of salt and white pepper. For example, for the first smoker session, a rack of oysters and a rack of shrimp are set up, thus about 3 dozen or so shrimp are lightly coated with the olive oil and then seasoned in the bowl, and laid out on the foil covered tray, ensuring not to cover up too many of the holes you poked earlier. Then about 2 or 3 dozen oysters are seasoned in the bowl and laid out on their foil covered rack. The same procedure for the bay scallops during the next smoking session, though more like 3 to 5 dozen of these little popcorn like tasty morsels are arranged on the foil lined rack. Once the seasoned seafood is set up on the foil lined wire racks, it is time to check the fire again and typically, the hot coals are ready for the wet wood by this time. Starting out with an equivalent of several cups of wet wood this is enough to start the smoke process. The 2-cup or so portion of wet wood is taken out of the soaking water and allowed to drain for a minute or so, nothing like putting out your fire and having to start over again….resulting in more scorn from the chef. The drained wet wood is gently placed onto the hot coals without disturbing them too much. Then the two racks of seafood are set into the smoker and the lid placed on top for the smoking process. Typically, the seafood only needs about an hour or so under the smoke, the shrimp may take longer if larger sized, but the oysters and bay scallops only need about an hour and they are ready. Once the seafood is smoked….know how do you know when they are done? Good question…and glad you asked…the seafood will take on a nice smoky light-brown hue and will become opaque, and the only sure-fire way to know when they are done is to sample a taste of the shrimp, or a scallop. The smoked scallops are like eating popcorn, just give me a bowl and I could eat several pounds of these tasty morsels. Now the oysters are okay if they are not completely cooked, but remember that overdone seafood is not that appetizing. So undercooking them a bit will not hurt, these will all be combined later in the Columns Hotel Vinaigrette Dressing which will also lend some cooking as well, as in a marinating process similar to ceviche. The smoked scallops are like eating popcorn, just give me a bowl and I could eat several pounds of these tasty morsels. I have cut down the typical restaurant portion for the salad recipe, it was one that never actually had a set list of ingredients, in fact, on occasion we would also smoke crab claws and add them to the salad as well. However, for simplicity sake, I have listed the ingredients here, and as a guideline, and this would yield about eight portions. Also, note that the weights for the seafood are after they are smoked, so be sure to purchase more than the amount listed because the seafood will shrink in size and weight after they are smoked. 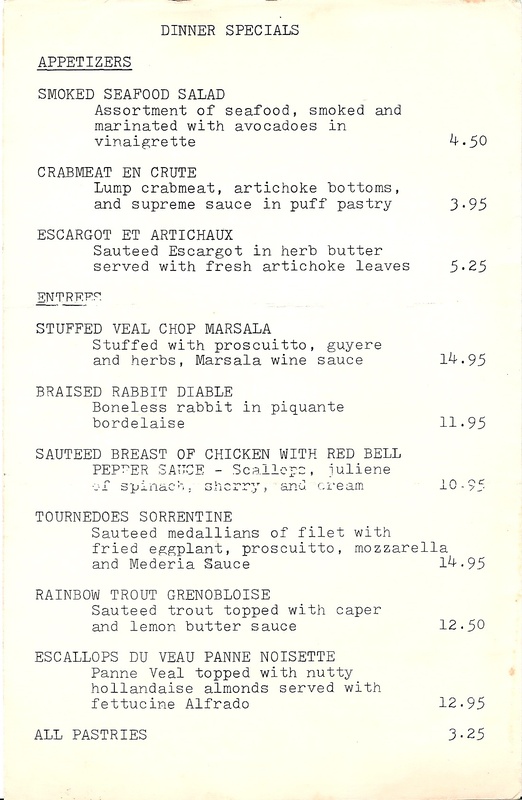 My apologizes for the quality of the image at the top right, this is a scan of a 4” x 6” image of the plated Smoked Seafood Salad that was taken and printed sometime around 1985 or 1986. Fuzzy most likely because I was rushing…it was going to be served really soon to an awaiting customer. 1. In a large stainless steel bowl, add the smoked shrimp, bay scallops, and oysters. Toss the seafood gently with the vinaigrette dressing and allow to marinate for about an hour or so. 2. Plating: When ready to serve line the plates with the lettuce leaves. Add the diced avocado to the smoked and marinated seafood, and toss well to incorporate. Spoon equal portions of the seafood, avocado, and dressing in the middle of the plate. Top with the remaining dressing if desired. 3. Garnish each salad with two tomato wedges and a sprinkling of toasted almonds, or about 1 Tbsp per salad. 4. Arrange 4 crab claws per salad in any fashion; however, as shown in the image above they are placed at the analog clock positions of 2, 4, 8, and 10. Then an edible flower is placed at the six-o’clock position. lovely smoked seafood salad, it sounds really tasty. I love that you have a photo from the 80’s. Don’t you just lov ethe little smoked bay scallops. So good and I like the size and texture. What a great salad. This salad would be a hit at my house, especially with the smoked scallops, love it! Yum! Avocado and seafood are my two favorite food groups! Gotta love retro food! This is good stuff! Wow, I love the smoked seafood here. Love mariscos!! Avocado and seafood! How awesome! Love the combination of these two! I never had smoked scallops. Must try smoking it at home. Very interesting. I learn something new everyday. Wow, that’s a lovely salad, very appetising indeed. Great information and great idea for a salad. Thank you for sharing.